Chris Warren doesn’t pop up much, and the underrated and unheralded back was on my list. One of the last cards I got in those Action Packed Rookies packs I’d buy at 7-11, this is a very solid picture of Warren. He eluded me when he joined the Cowboys blocking for Emmitt Smith at Cowboys’ Training Camp in Austin, but I kept the card all those years. When the paid event came up, I thought I might as well knock him off my list. Chris Warren started at UVA but finished his college career at Ferrum College, a tiny Division III school in Virginia. 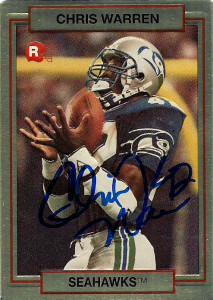 After putting up solid numbers for the Panthers, Warren was drafted in the 4th round of the 1990 draft by the Seahawks. Seattle had recently lost career leading rusher Curt Warner to free agency, and with JL Williams not getting any younger, Warren was a good fit for the team returning kicks and getting spot duty when he could. In 1992, Warren recorded his first of 4 1,000 yard seasons for the Seahawks. In 1994 he ran for a career high 1,545 yards on 333 carries. He also logged a career high with 323 yards receiving. Chris played for the Seahawks through 1997. In his final season with the team he recorded a career high 45 receptions, but with him now recording back to back 800 yard seasons, Warren was not viewed as a feature back anymore- at least for the money Seattle was willing to pay him. Warren signed as a free agent with the Dallas Cowboys in 1998. He spotted Emmitt at runningback while blocking up front for him over the next 2 and a half seasons. Warren played one final game for the Philadelphia Eagles retiring after the 2000 season. His son in 2014 recently signed a letter of intent to play for the Texas Longhorns.